Don’t think of passing by. Novosibirsk is a mandatory stop on the Trans-Siberian Railway. In addition to being the capital of Siberia, Novosibirsk is an important cultural, scientific, tourist and transport hub, as well as Russia’s third largest city. It is a very young city, founded in 1893, and it holds the Guinness record as the city that has reached a population of one million in the shortest time (in only 70 years). I’ll tell you what to see and what to do in “New Siberia” or, rather, in Novosibirsk. If you are making the Trans-Siberian Railway a mandatory stop, after Yekaterinburg comes Novosibirsk. Don’t think of passing by. It is the capital of Siberia, Russia’s third largest city after Moscow and St. Petersburg, with a population of 1,600,000. 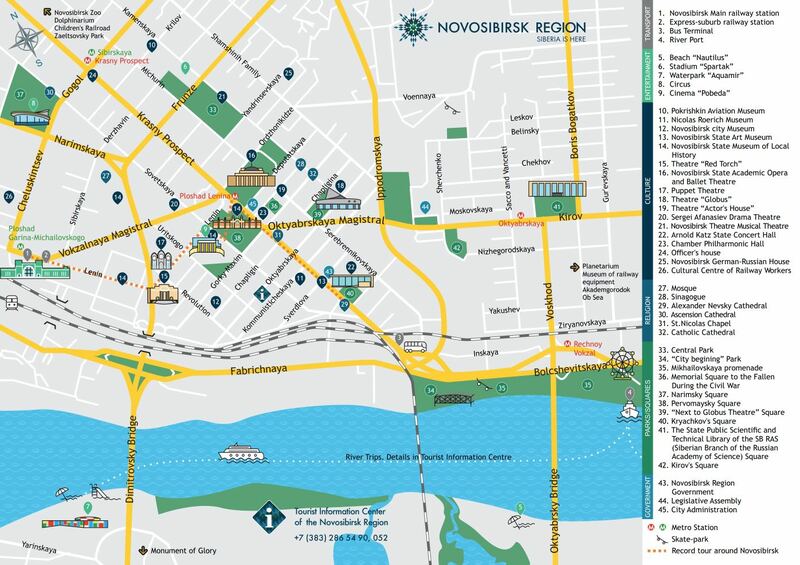 Novosibirsk is a young city, born as a result of the extension of the railway into Central Asia and the Far East and, at the same time, it serves as a connection to the capital city Moscow and European Russia. In fact, Novosibirsk was founded in 1893 by workers who were building a railway bridge over the Ob River, which crosses the city and divides it into two parts. Czar Nicholas II named it Novonikolayevsk in 1903, giving it city status. It was created with primitive wooden buildings. Brick was only used in the St. Alexander Nevsky Cathedral (1896-1899) and the Chamber of Commerce (1910-1911). In 1926 it was given its current name, Novosibirsk, which means “New Siberia”. Later it became a highly industrial city, mainly in the Soviet era, with its five-year plans and a massive exodus to Novosibirsk during one of the waves of Siberian migration in the country. The strong demographic growth put Novosibirsk in the Guinness Book of Records as the city that had been the fastest to reach a population of one million, in just 70 years. (Chicago took 90 years to reach one million, New York 250 years and Moscow 700 years, to name a few examples). Despite not having the historical and artistic heritage of other places in the country due to its relatively recent founding, nowadays Novosibirsk is a city that has diversified its economy in the areas of science, transportation and tourism, beyond the post-industrial context. In addition, it is a cultural center of prime importance in the entire Russian Federation, as attested by its numerous museums and theaters, as well as its high-quality music programme. Of course, if you go in winter, you should wrap up well because it is a cold city, with very severe winters but mild summers. As for the hours of daylight, they vary from about 7 in the winter solstice to 17 in the summer. First of all, you should note that Novosibirsk is 4 hours ahead of Moscow, and that it is located 3,360 km away on the fastest road route. Therefore, the best options are by train or air. 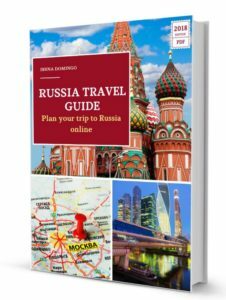 The railway options from the capital Moscow are many, since Novosibirsk is the main stop on the Transiberian after Yekaterinburg and it is located halfway between that city and Irkutsk, the gateway to the Lake Baikal area. The shortest train ride takes almost two days and costs between 50 and 130 euros approximately, depending on the train, the type of compartment and the time of year. 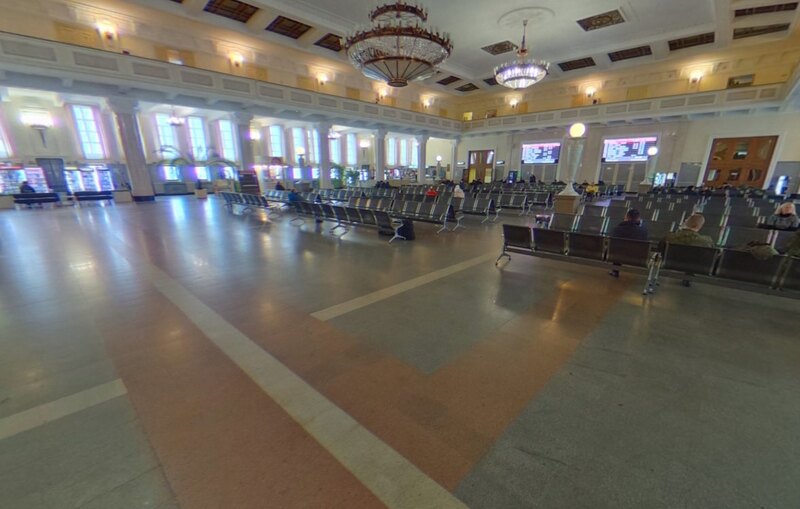 The main arrival station is called Novosibirsk-Glavny. 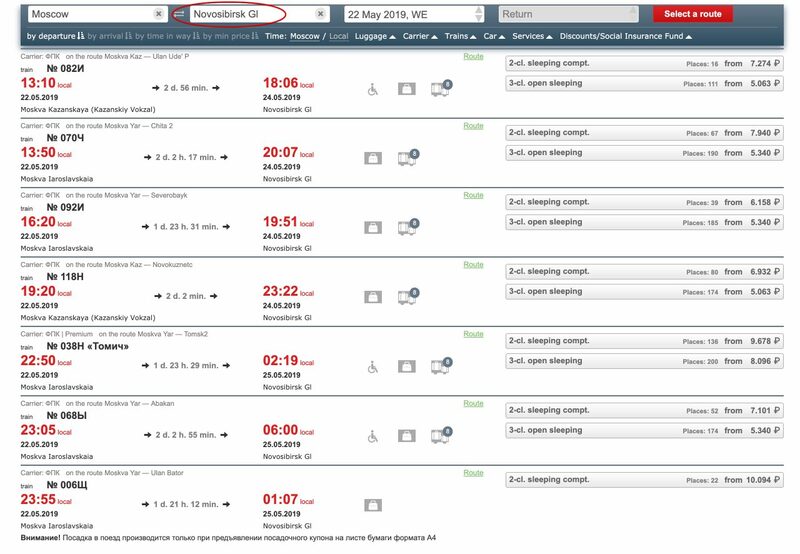 On the official Russian Railways website you have to look for it under the name “NOVOSIBIRSK GL”. The station has lockers in case you want to leave your luggage to visit the city and return to take the next train on the Trans-Siberian Railway. Travelling by air, you arrive from Moscow (from different airports) in less than four hours on direct flights, with departures to the Novosibirsk’s Tolmachevo International Airport, only 17 km from the city center. In the following sections I will be showing you this city and I recommend that you stay for at least 1 or 2 days, depending on the time you have available. The main attractions of the city are located in the downtown area, so many are accessible on foot. You can also use the city metro which was inaugurated in 1986 and which has two lines that link the most important points of the city. It is simple but very effective. It connects the two parts of the city that are separated by the river. 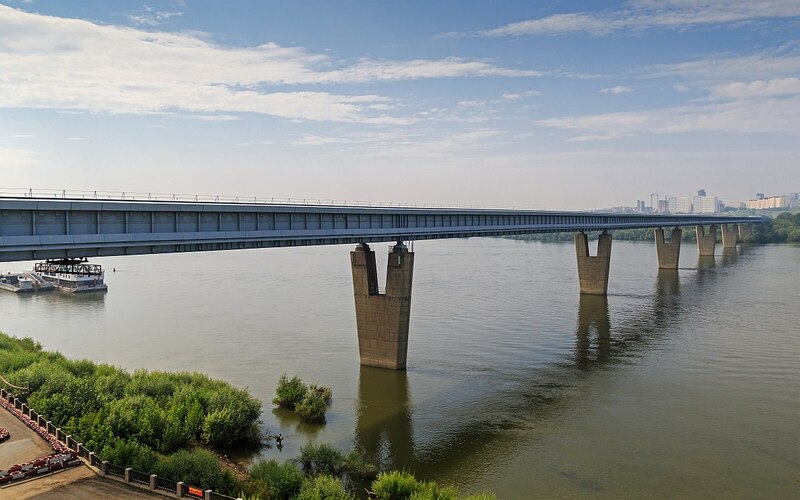 Something special about the Novosibirsk metro is that with a length of 2,145 meters, it has the longest metro bridge in the world (896 meters in the part that runs over the river).It stretches 50 centimetres between winter and summer, due to the great differences in temperature. It opened in 1986. There is also a dense network of trams, trolleybuses and city buses, in case you want to get further away from the downtown area. If you like boat rides, in summer you can take cruises on the Ob River which is frozen for a good part of the year. 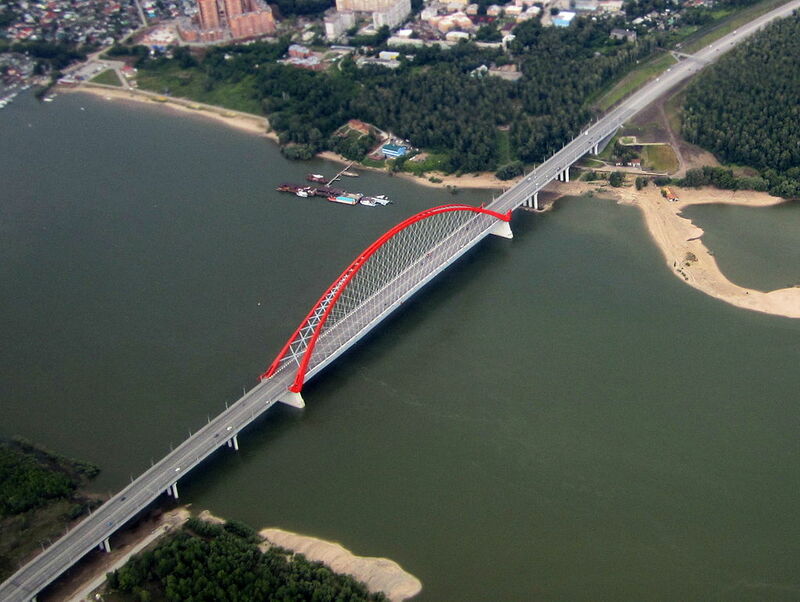 During the ride you can see the Bugrinsky Bridge over the Ob River, which has the longest arch span in all of Europe (380 meters) and the world’s largest mesh arch in the world. It is becoming one of the best known landmarks in the city. Its 2 kilometres shine brightly at night. It was inaugurated by Vladimir Putin in 2014. If you arrive in the city in winter and need to buy warm clothes, you have two large shopping centers downtown: Aura and Gallery Novosibirsk. 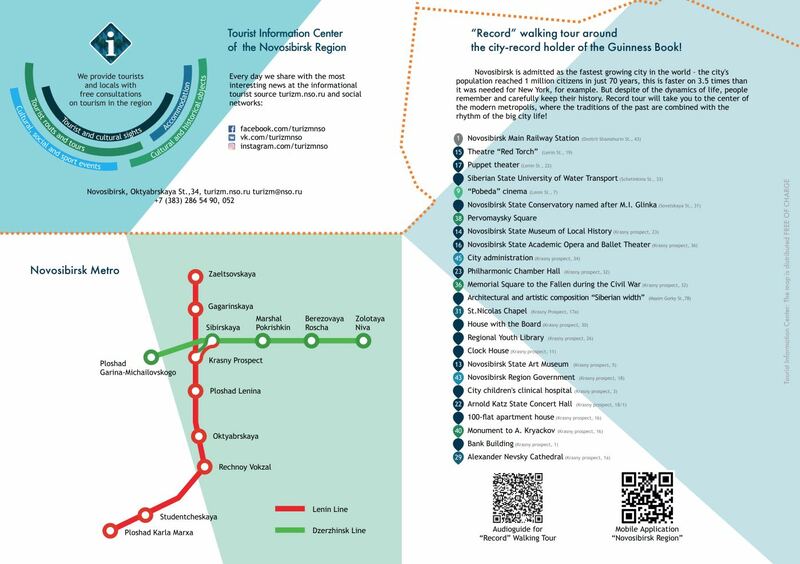 The route that I am suggesting starts at the city’s main railway station since it is most likely that you will arrive in Novosibirsk by train. The main railway station, Novosibirsk-Glavny, is the main entry point to the city and the point of important connections. 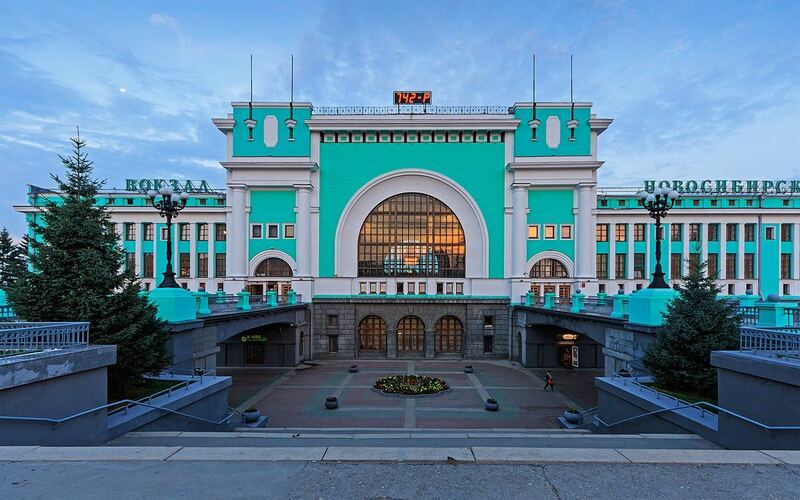 In addition, it is the largest station on the Trans-Siberian Railway. It also has a metro station attached to it. 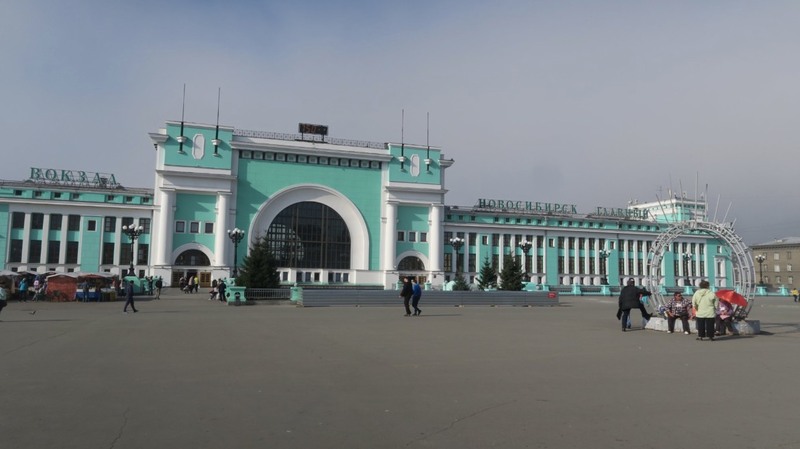 Trains depart from Novosibirsk-Glavny to any part of Russia and to the rest of Siberia and the Far East in particular, as well as to international destinations such as Beijing or Ulan Bator (Mongolia). The current station, dating back to 1894, is part of a 1939 project. The building was renovated in 1999. It has been recognized for its importance as a heritage site and its style is neoclassical. The very original green colour of its façade stands out. Outside the station is the Nikolai Garin-Mikhailovsky Square, named after one of the first architects to spearhead the construction of the Siberian Railway. 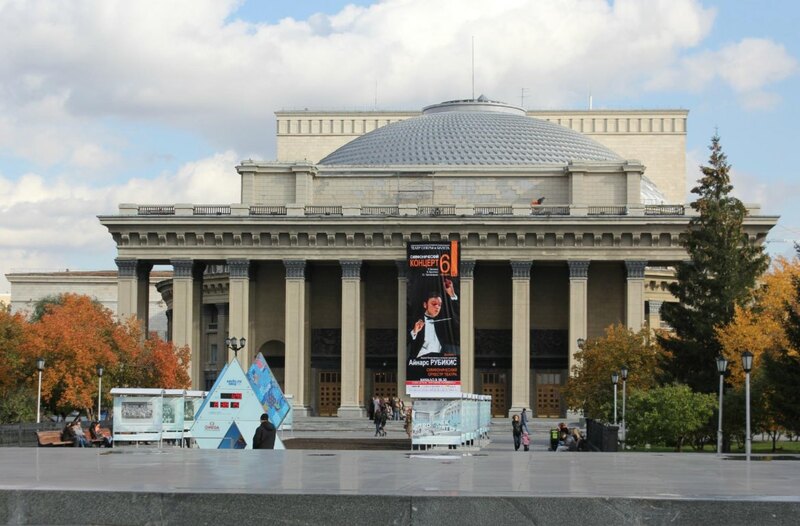 If you leave the station and walk about 20-25 minutes along Vokzalnaya Magistral Street, you will get to the Novosibirsk State Academic Opera and Ballet Theater, which is larger than the ever famous Bolshoi Theater in Moscow, and larger than any other theater in the country. This theater has been in operation since 1945 (although it started being built in 1931 and some final details were completed in 1956). It has a well-deserved international reputation with its famous performances. The building, with its Soviet neoclassical style, is already historic and one of the most famous symbols in the city (and by extension in Siberia) in the central Lenin Square (or officially at 36, Krasny Avenue). It has a dome that is 60 metres in diameter and 35 metres high, crowned with a roof that is a beautiful sight to behold in the nightscape. Its grandeur also stands out on the inside which has a set of 16 beautiful statues and a chandelier with 472 crystals in the main hall. Nicknamed the Coliseum of the region, it is for me, a must-see in the capital of the Siberian Federal District. As it is also an academic institution, it has its own ballet company, opera, choir and orchestra. 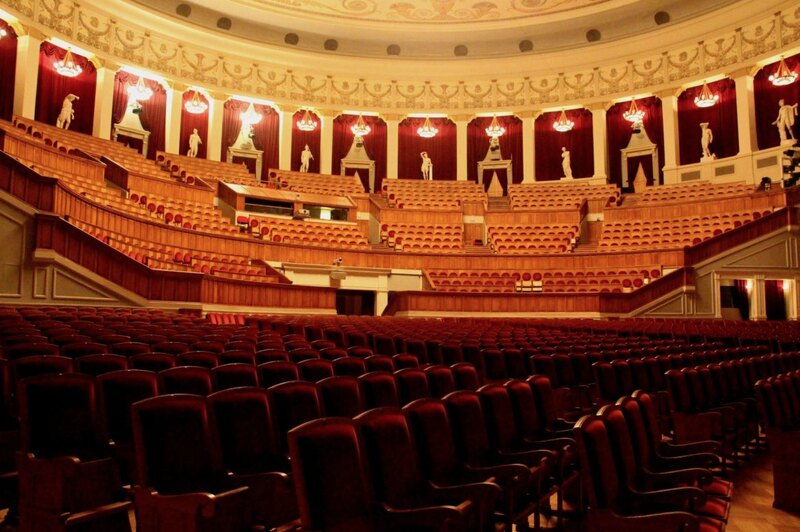 Its largest and main concert hall can seat 1,774 people. 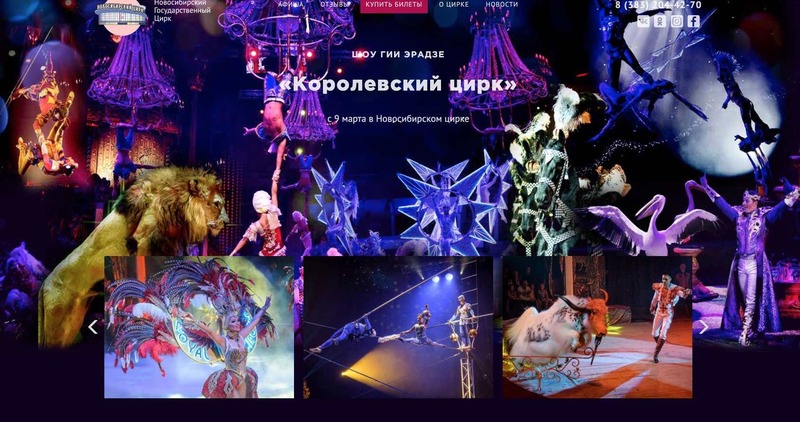 Online tickets can be purchased for a maximum of between 500 and 4,000 rubles, very attractive prices for the quality of their productions. 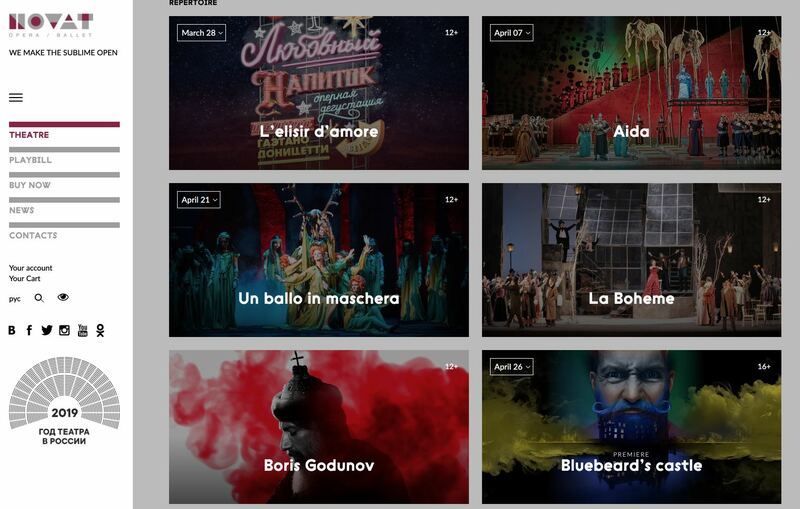 The operas are usually at 7:00 p.m. I highly recommend that you attend a performance. It’s very easy to buy tickets online in advance on their website. The Lenin Monument is located in the square of the same name. This is also where the State Opera and Ballet Theater is located. The monument was inaugurated in 1970. 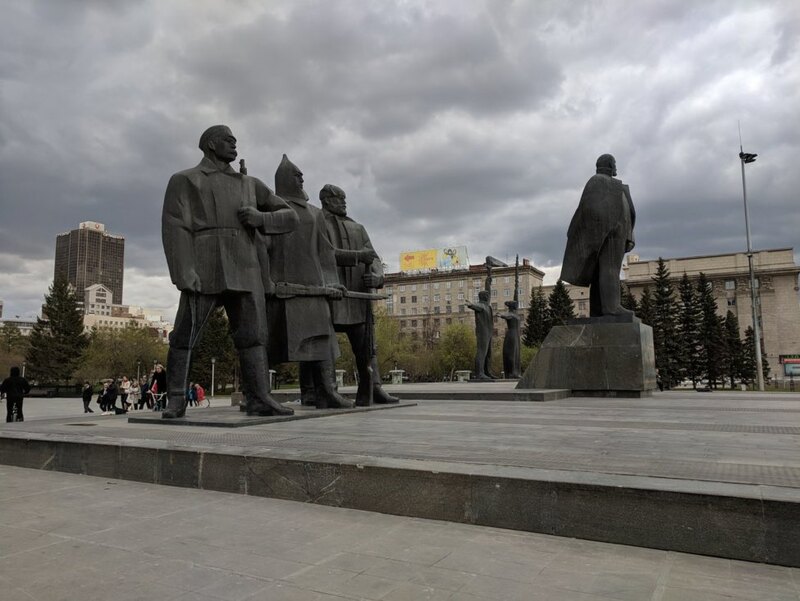 Apart from the Lenin Monument, the square has a few more very evocative and imposing figures, representing the living forces of the Russian Revolution. The State Museum of Local History is an institution that, apart from the museum of the same name, includes other museums, such as the Museum of Nature, in different buildings in the city, with more than 260,000 objects in total. Here I will mention the two specifically since they are the most interesting. The Museum of Local History itself, located at 23 Krasny Avenue, the avenue which is the city’s long main artery, will serve to introduce you to the history of this important area of ​​Siberia, including the basic activities of its native peoples, from the Paleolithic Age to the settlements of the last centuries of our era, in addition to the important ethnographic, geological and paleontological collections dealing with the region. In one of the halls there is an explanation of sun worship and shamanism as traditional beliefs of the local people. Since 1985, this museum has occupied a historic building with a neo-rationalist design and it is protected by the state. It was built in 1910-1911 and housed the Chamber of Commerce. 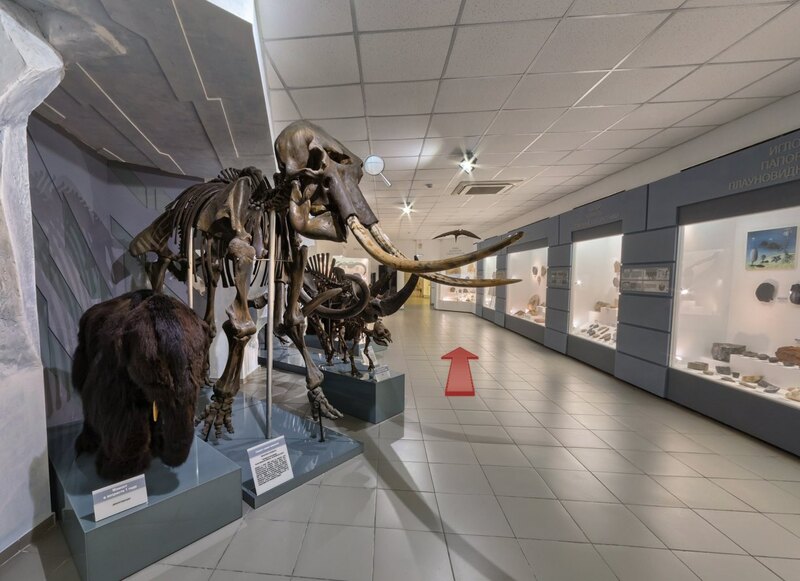 A unique item is a complete mammoth skeleton, which you will find in the Museum of Nature (address: 11, Vokzalnaya Magistral), as well as findings from expeditions through Siberia in the first half of the 20th century. The mammoths are a breed of extinct mammals estimated to be more than 3,700 years old, with parts of specimens well preserved by Siberia’s glacial temperatures. Consequently, the notoriety of the skeleton on display is evident. Also worth noting, in addition to the mammoth, is the skeleton of a woolly rhinoceros (also extinct), a reconstructed cave bear or dinosaur fossils. Opening hours of the two museums: Wednesday to Friday: 10 a.m. – 6 p.m. Saturdays and Sundays: 11 a.m. – 7 p.m. Monday and Tuesday: closed. Museum of Local History: 200 rubles with discounts for students, children and family passes. Museum of Nature: 100 rubles also with discounts. 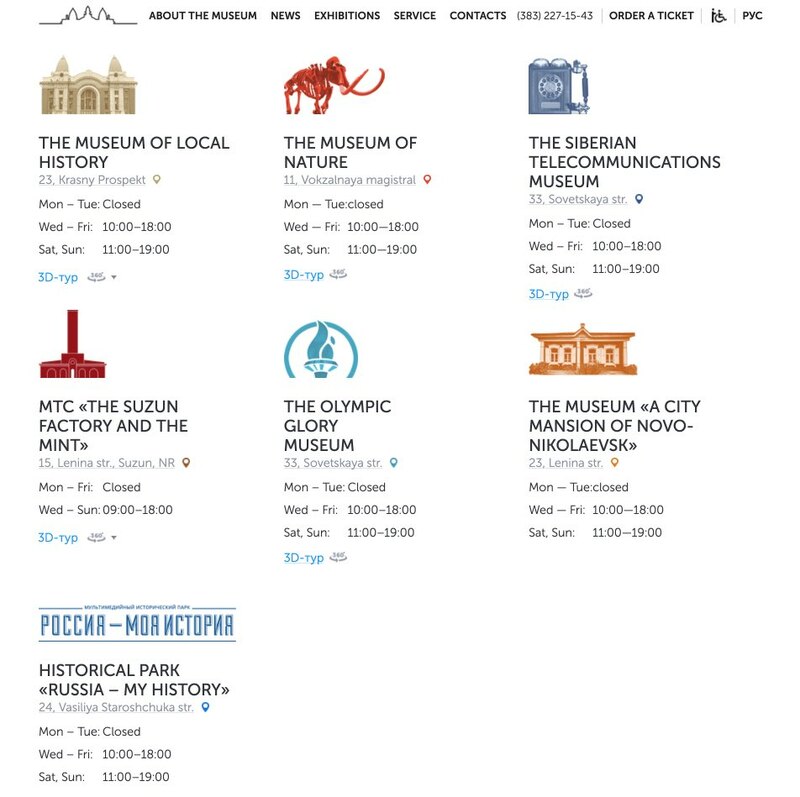 On its website you can see the location of other museums belonging to the State Museum of Local History, such as the Olympic Glory Museum, or the Siberian Telecommunications Museum, among others. This prestigious entity was founded in 1937 and includes musical groups with different formats and soloists. The Novosibirisk State Philharmonic Orchestra stages numerous concerts in different venues in the city and in the region. The Chamber Hall in the House of Lenin (32, Krasny Avenue,), a building with and important past history. 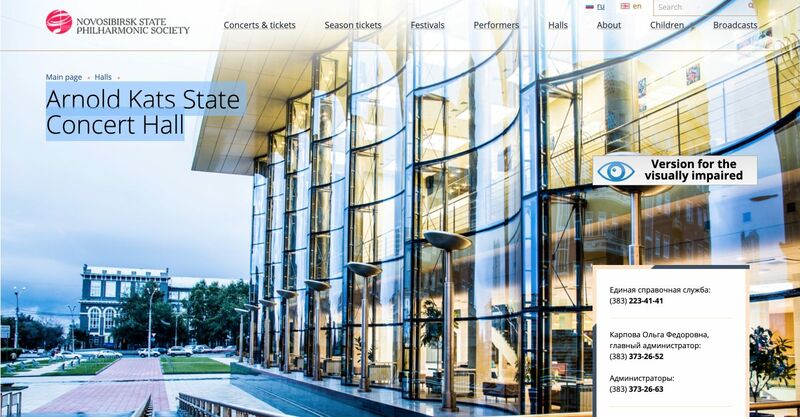 Online sale of tickets, and festivals, not only of classical music, but also of jazz, folk, choirs, etc. 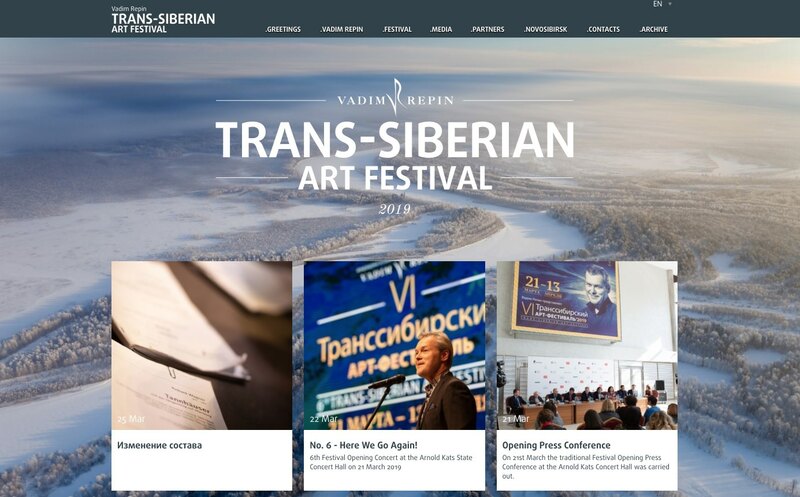 To this varied musical offering we must add the Trans-Siberian Art Festival, a high-quality international affair. This festival is led by the renowned Novosibirsk violinist, Vadim Repin, and most of the performances take place between March and April. So it’s a good opportunity if you want to see this part of Russia outside of summer. A small chapel built between 1914 and1915. It was demolished in 1930 but rebuilt in 1993 to commemorate the city’s centenary. It was located on a site very close to the original one. It is located at 17 Krasny Avenue on the same street as other must-see sites in the local cultural history outlined above. Further away from the city center, but accessible on foot, is the St. Alexander Nevsky Cathedral. Belonging to the Russian Orthodox Church, it is a modest cathedral compared to the most prominent and important Russia cathedrals. It is unique for being the first stone building in Novosibirsk, dating back to 1899, just six years after the first human settlement in the city. It was consecrated again in 1991, after being closed in the Soviet era. Russian Byzantine style and state-protected. Located at the intersection of 1, Krasny Avenue, and Sovetskaya Street. 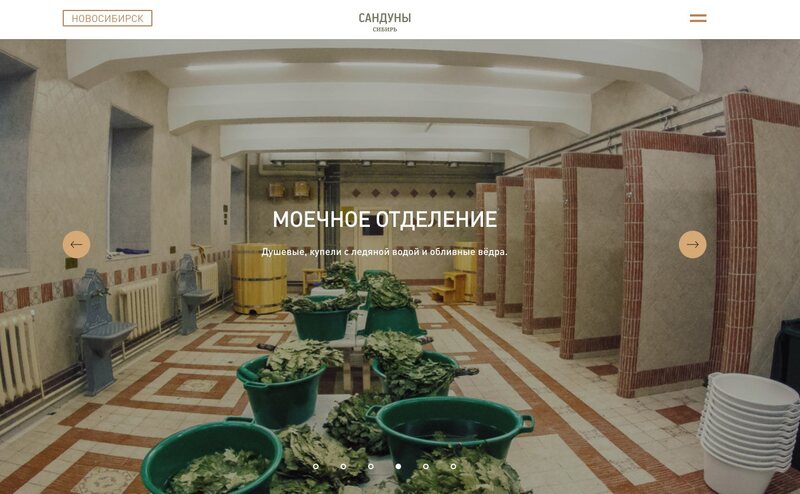 A good place to take a Russian banya is in Sanduny, a branch of the famous banya based in Moscow. 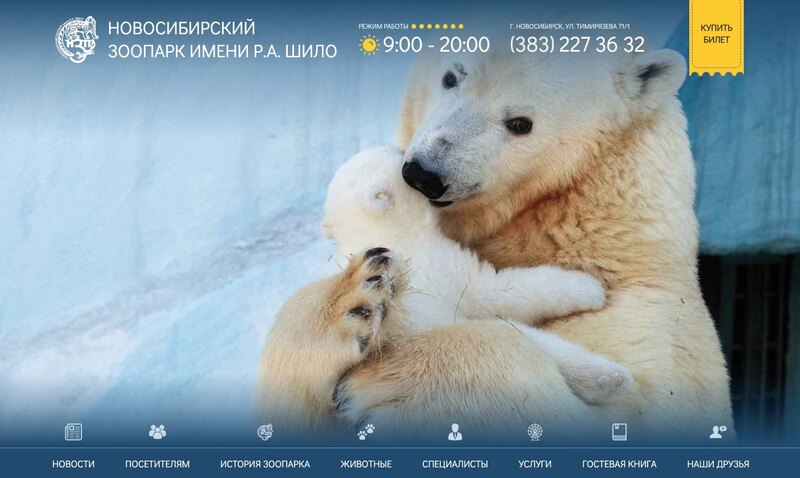 The Novosibirsk Zoo (address: 71/1 Timiryazev) is one of the largest and best in Russia, in a very natural setting: the area of the Zaeltsovsky Forest Park. The information on the park is eloquent: 11,000 animals of 770 different species. Working in conjunction with various international programs, great care is taken with the reproduction and breeding of those that are threatened or in danger of extinction. An example would be the Asian Siberian grouse. In total, it occupies about 65 hectares and is named R. A. Shilo. The emblem of the zoo is the snow leopard, a unique animal of great beauty that lives in Altai, the mythical region of incredible landscapes in Siberian territory. In addition, it has remarkable felines. In 2000 it was discovered that the zoo had black lions, supposedly coming from a circus in their time, the closest to the missing lion of the Cape of South Africa. 2012 saw the birth of Kiara, a rare liliger puppy (a mixture of a male lion and a female tiger, which is the hybrid offspring of a male tiger and female lion). The event made world news. The zoo has around 1,500,000 visits per year and gets prestige from also being an important scientific institution. The prices are very cheap: 300 rubles for adults and 150 rubles for children ages 7 – 16. It offers many activities for the little ones and family excursions, also by train. Opening hours: Summer, 9 a.m. – 10 p.m; Spring / Autumn, 9 a.m.- 8 p.m.; Winter, 9 a.m. – 6 p.m./ 7 p.m. There are different ways of getting there, but surely the most comfortable will be the one by trolleybus No.2 that leaves the city’s main railway station and takes you there in about 20-25 minutes. 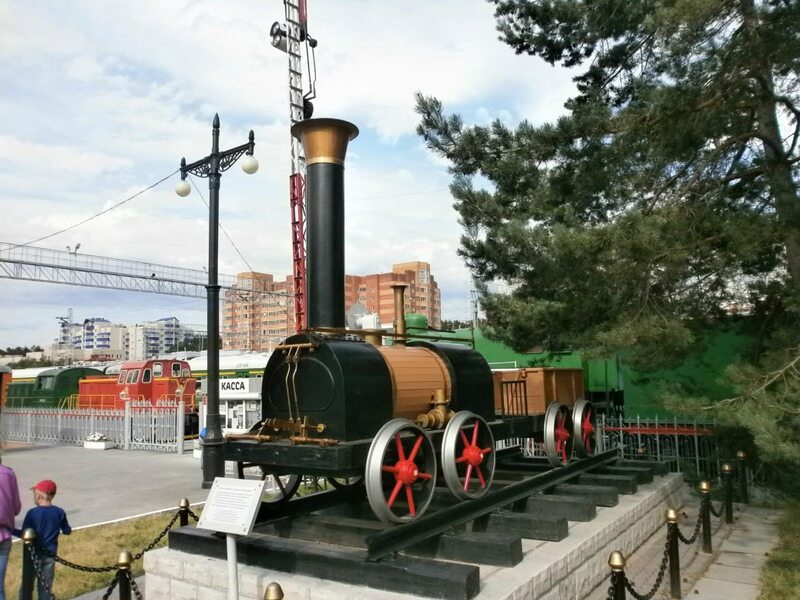 This is an open-air museum founded in 2000 that will help you understand the extreme importance of rail transportation in the development of Novosibirsk. You can see locomotives, passenger and cargo coaches, as well as snow plows or other tools that are very useful in Siberia. Some special trains are an armored carriage for the Czar or another that served as a hospital in World War II. It is located about 25 kilometers from downtown Novosibirsk and has train and bus stops nearby. You may also get there by taxi. Address: 39, Ulitsa Shamshurina. Opening hours: 11 a.m. – 5 p.m. Monday to Saturday. Sundays: closed. Adults: 70 rubles. Children: 25 rubles. For the whole family and also for tourists. 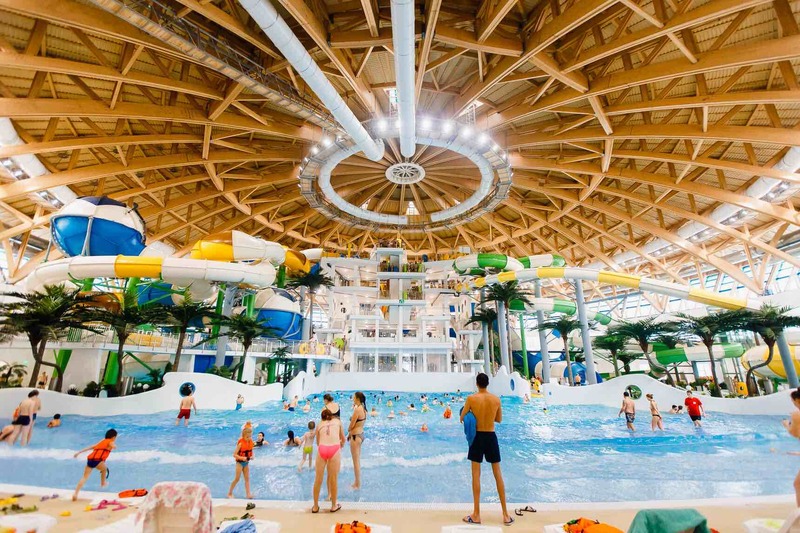 It seems that it is Russia’s largest indoor water park. Akvamir has incredible slides for the most daring. Very interesting and surprising, if you experience it in winter, with the snow outside. It is located at 8, Yarinskaya Street. The current building that houses the Novosibirsk State Circus has been there since 1971 and can hold 2,300 people. It is a good fun option if you go with children. It is located at 21, Chelyuskintsev Street, (Zheleznodorozhny district). Akademgorodok (literally “Academic City”) has been one of the scientific emblems of the Soviet Union since 1958, a city created in the middle of a forest about 20 kilometers from Novosibirsk expressly for research talent. Today it brings together first-rate educational institutions and universities in Siberia. There are also some theme museums of Siberian culture or wooden architecture, or the Botanical Garden. With the collapse of the Soviet Union in 1991, there was a brain drain to laboratories and technology companies in Western Europe and the United States. Before this there were some 65,000 scientists with their respective families. It is currently maintained as the technology park Academpark, the Silicon Valley of Siberia for those who like bolder names. Part of it is the Information Technology Center, built in 2010 to support the most innovative business initiatives. It stands out with its very modern architecture featuring two towers connected at the top in a very original way. And that’s it for this tour of the capital of Siberia, an extraordinary cultural center and a mandatory stop on your journey on the Trans-Siberian Railway. If you have found this article useful, you can help me by sharing it on your social networks. Thank you very much!